Our family really enjoys ribs. Over the years we’ve used a number of different techniques to make them. We’ve boiled them and then finished them on the grill. We’ve baked them. Sometimes we’ve used a dry rub – other times we haven’t.Well, I think we’ve finally figured out the easiest way to get flavorful, tender smoky ribs. You don’t need any special equipment. A gas or charcoal grill will work just fine. Wood chips you can find just about anywhere. I used mesquite but you can use apple, cherry or whatever suits your fancy. Finally you’ll need a dry rub, barbecue sauce and babyback ribs. Making a flavorful dry rub for ribs or chicken couldn't be easier. This rub is the right mix of savory herbs with just a touch of heat and sweet. Combine all ingredients in a bowl. Stir with a fork or whisk. Generously rub on ribs or chicken. Leftover rub can be stored in an airtight container or resealable plastic bag. This is the membrane. Find the end of it and pull it off. 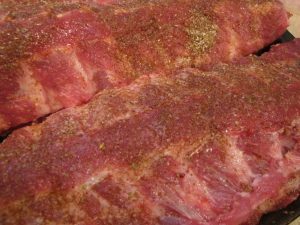 There are lots of different rub mixes out there, but it’s super simple to make your own. Lightly sprinkle the ribs, both sides, with the rub, then press it into the ribs. The key to tender flavorful ribs is cooking them ‘low and slow’. 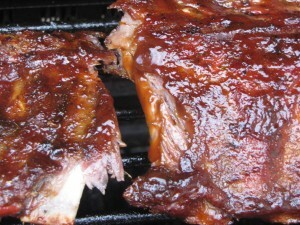 The ribs take 2 ½ to 3 hours to cook. For the first two hours, cook them at 275˚. A grill with a temperature gauge is super helpful to have. I use a gas grill. Using only the two right burners on a medium to low setting, place a foil pack with wood chips that have been soaked on the grates just above the flame. As the wood chips dry out, they’ll produce smoke which will impart its own flavor to the ribs. Notice the packet of chips over the open flames. 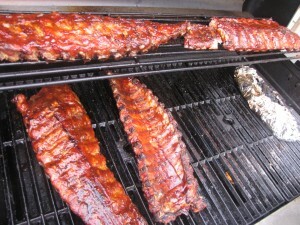 As the ribs cooked I rotated them around the grill and flipped them. For the last hour I basted them with barbecue sauce. For the last 45 minutes or so, increase the heat to 325˚ and brush the barbecue sauce of your choice on the ribs. I usually purchase a good quality barbecue sauce and thin it out a little bit with some apple cider vinegar. 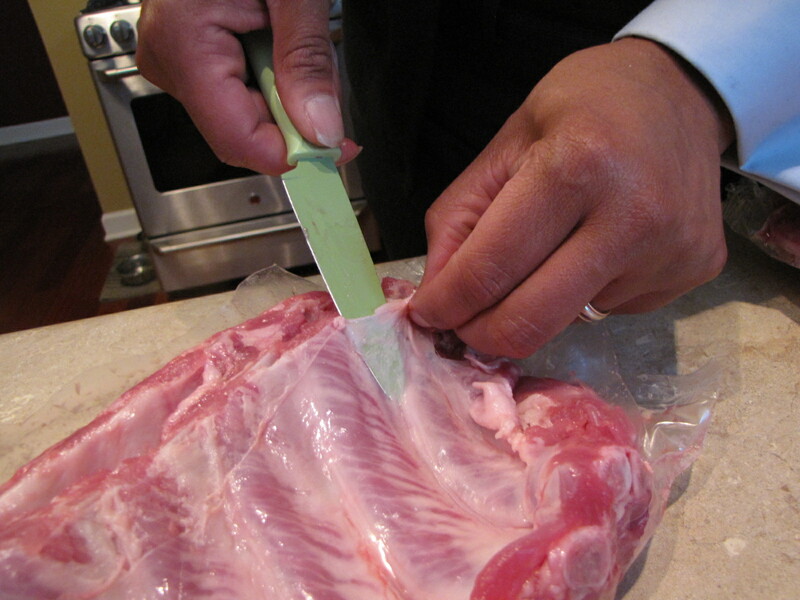 Another tip, flip and rotate the ribs about every 20 minutes. Enjoy! 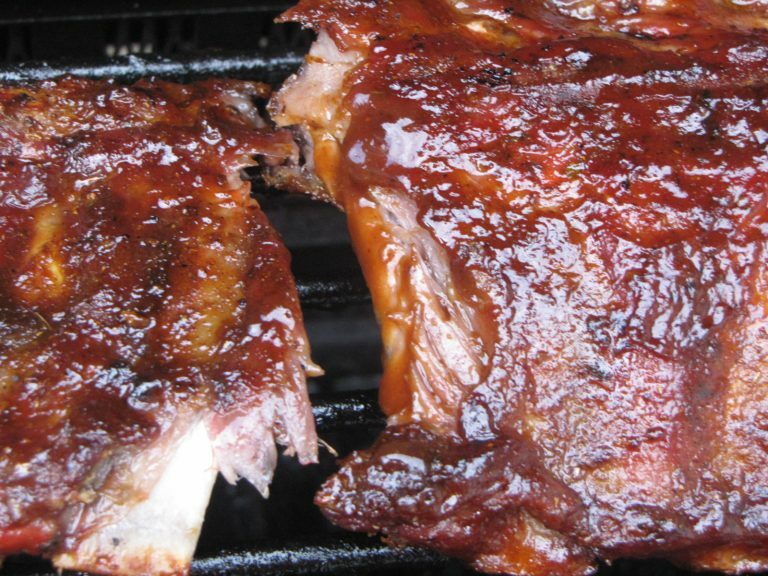 This closeup shows how tender the ribs get. When I flipped them they broke apart. Mmmm . . . yummy! Originally posted May 12, 2010. Thanks for the dry rub recipe–looks very flavorful! You won’t get the ‘smokiness’ from the oven. We do ribs in the oven and they always turn out great. I would still try your charcoal grill to finish the ribs. Start them in the oven on low and then transfer to the grill. If you cover them with foil while they’re in the oven they will take even less time to cook. Please let me know how you make out! Do you use prepared mustard or powdered in the dry rub? I use dry mustard in the rub. I DO like to add a bit of mustard to my BBQ sauce too.